This page is dedicated to one of those many talented persons who stood up and added their special magic to make this project what it was. With very small means the Gothenburg historical reconstruction painter Lars Gillis Larsson helped create visual images on how things had been, and what it would look like, if we only managed to build the ship. And make the journey. Since the project was started by a very small group of enthusiasts with an idea and a muddy plot of industrial wasteland we had actually just borrowed from the Eriksberg Development Co., there were very little to show the few visitors that could be lured out to take a look at what we were up to. For many, many years there were nothing even remotely like a ship to show. All we could do was to tell about our dream and try to make our visitors see it too. As soon as we at least got the shipyard going, Lars Gillis' talent became instrumental in showing the next steps. 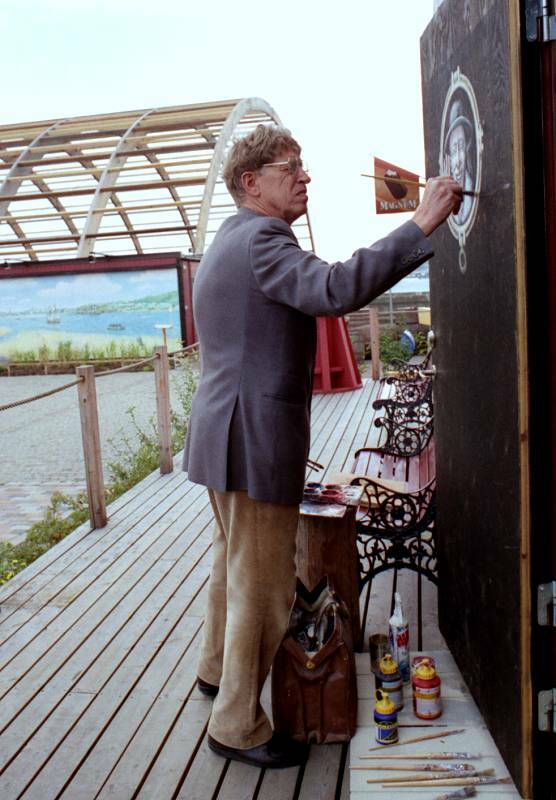 During these years the shipyard was our second home and I personally can't imagine the project without his paintings. A web page dedicated to his work is long overdue. Shipyard Café Door tromp leu of a ships window. Eventually one day we found Lars Gillis brightening up the inside of the shipyard café door with a tromp leu painting of a ships window, and the happy face of the project founder Anders Wästfelt peering in. Acrylic on plywood. 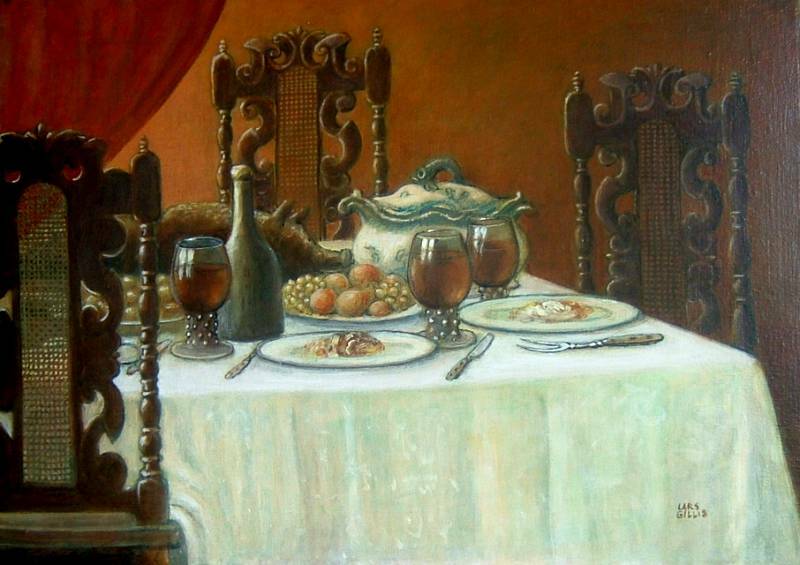 Painting by Lars Gillis, 1996. In the background the 7 meter long view of the Gothenburg harbor entrance can be partly seen displayed on the souvenir shop wall. Both paintings probably lost when the shipyard was demolished. The first concern when planning the shipyard area was to make it a nice and interesting place to visit. This was an absolute necessity since that was how the sponsors eventually would be met and introduced to the project for many years to come. The problem of how to make everybody else see what we saw, was much helped by Lars Gillis. The view was looking up the Göta Älv towards the city of Gothenburg. Towards a modest compensation barely covering the paint Lars went ahead to paint this mural. 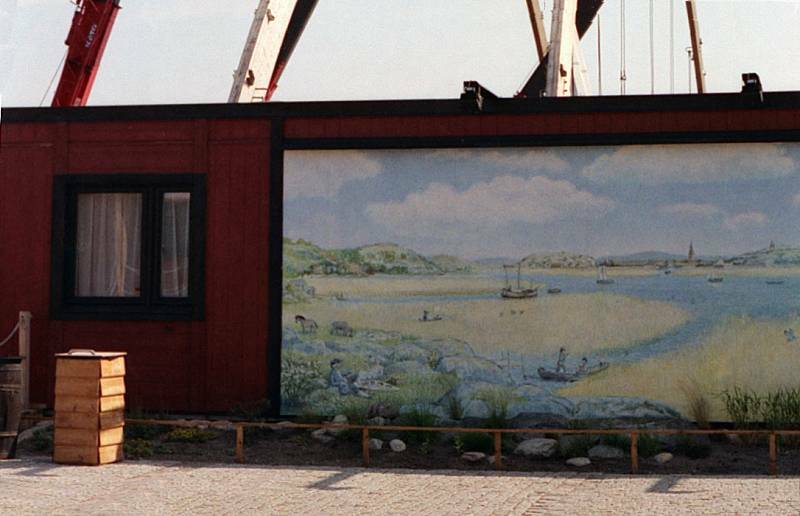 This mural was lost or discarded when the shipyard was demolished. Acrylic on hardboard, 2x7 meter, 1996.
to interact with the painting and to create a three dimensional effect. 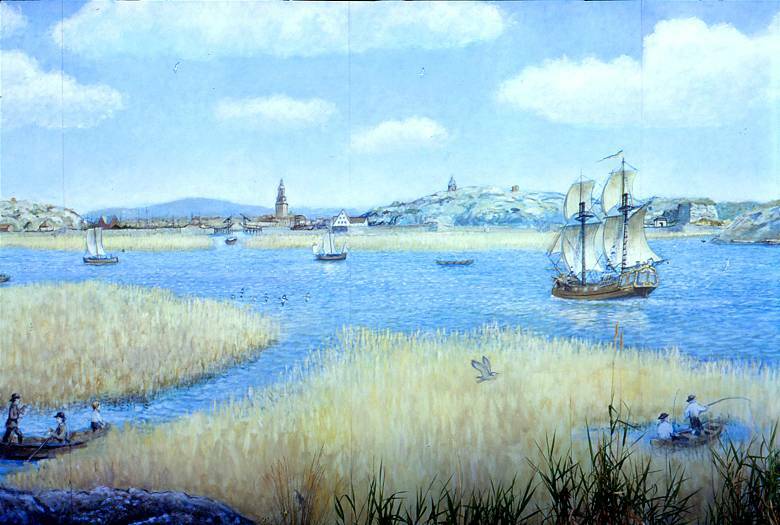 Immediately facing any visitor entering the shipyard from its main entrance was this 2 x 7 meter long mural showing the Gothenburg harbor entrance as it should have looked at the time of the homecoming of the Gotheborg in 1745. It was displayed on the wall of the Shipyard's souvenir shop. This was the natural meeting place and the starting point for all guided tours of the shipyard. 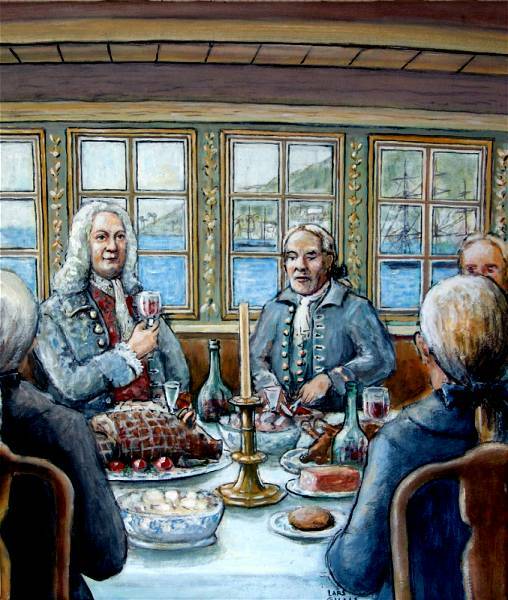 Reconstruction painting for the book "Jan-Erik Nilsson: Food on-board Swedish East Indiamen (MS)". 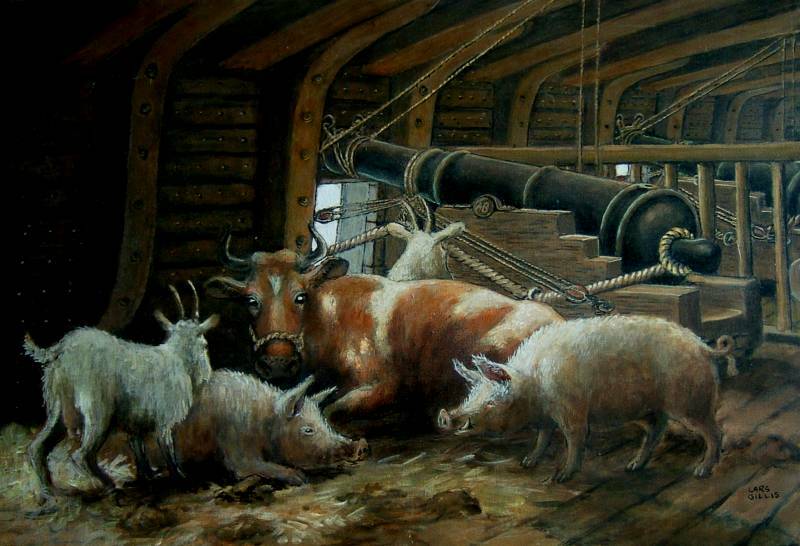 One of the things that captivated the imaginations of the visitors was to listen to how the crew lived on-board, and how live farm animals in large numbers were kept on-board together with the sailors, to provide fresh eggs, milk and to eventually be eaten along the road. When this picture was painted the keel was just barely laid out and there were no way to really know how the ship would look inside. But Lars Gillis could help. It eventually turned out to be remarkable correct. Lars was personally very proud of this picture that indeed turned out very well, but was also half ashamed that he taken some artistic liberties in that in reality the live stock was kept in the middle of the ships hull as in barnyard style, and not near a canon port like this, however, I still think it communicates the general idea very well. However, you would in reality be sleeping along the walls in a barnyard with animals doing what animals do when they have eaten - or drinking. It would have been very, very crowded with a crew of 140 persons, all this live stock and as much cargo and luggage that you could possible bring. Also most culinary efforts from the ship's cooks side would probably also have been pretty much wasted, since the entire crew would have been both eating and sleeping in pretty much the same area as the cows and pigs. This was maybe the most visionary and important paintings that was made for the project. For the first time we had a picture we could call our own that could show what the ship we had actually started to build would look like when she sailed. On the painting she looks lower then she actually turned out to be, which is probaly historically correct. . 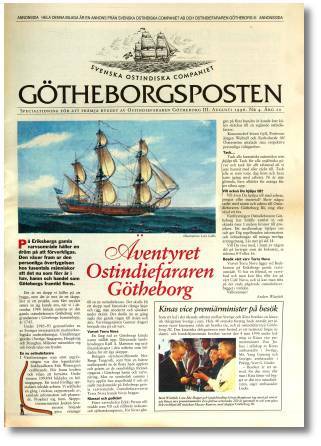 This painting was used on the cover of the Gothenburg Post Issue 4, August 1996. The layout and printing costs and distribution of this 16 page newspaper in 360,000 copies along with the regular GP newspaper, was a sponsorship effort from GP, at that time one of the most important sponsors of the project. In practice we had unlimited access to as many and as large ads that we wanted, in GP. Project conceptualization as it appeared here in full, editor and author of most of the texts was me, Jan-Erik Nilsson. The photographer Sten Zachrisson, whom I traveled around with for a week, took take all pictures we needed for this magazine. With this, the popularity of the project and the support from the common population in Gothenburg now reached the proportions of a 'ship craze'. If you said you worked for the 'project' and needed to go to the shipyard area, a taxi driver would send you there for free. (I experienced this myself from a driver who had no idea about who I was.) The commitment and the volunteers free work towards something as impossible as this, had captured the hearts of the people and everybody wanted to give a hand. Still the large sponsors were biding their time and only a few had committed to some support, mostly in the form of products. At this time Eriksbergs Förvaltnings AB have supplied the land on which the shipyard stands, most of the labor force concerned with the actual ships building was paid for by us or the Länsarbetsnämnden as a unemployment relief project. All cash money was made from or donated by the 'Friends' organization or small hands in the community. All project management was volunteered. Material gifts and small donations poured in. 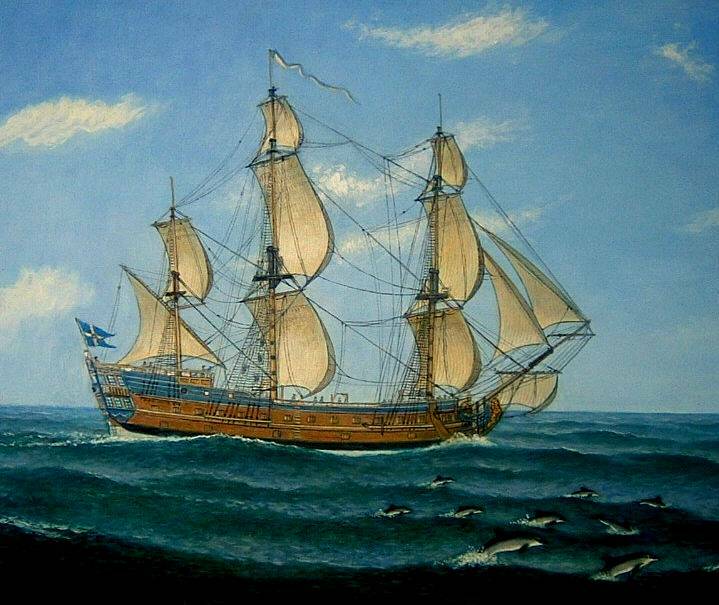 Painting based on a reconstruction drawing for "Jan-Erik Nilsson: Food on-board Swedish East Indiamen (MS)". 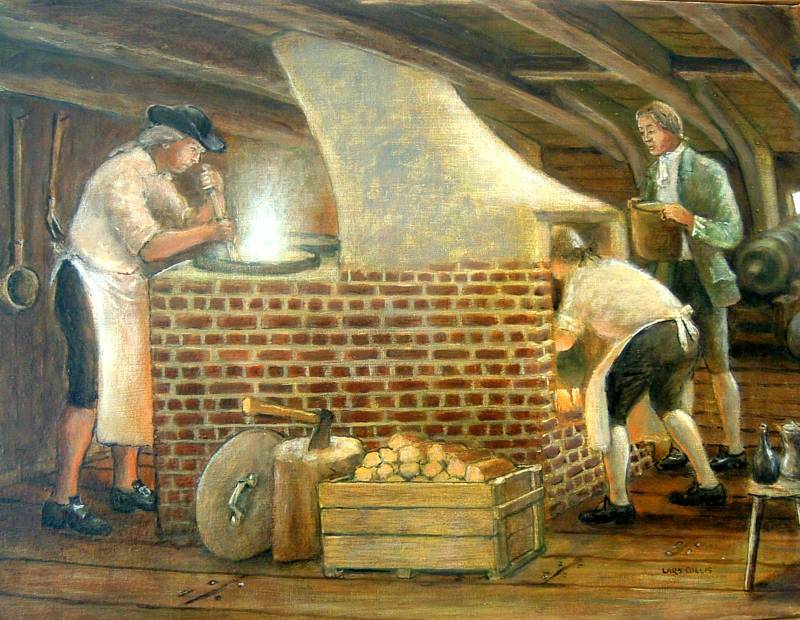 The ship's pantry was located near the fore of the ship so that the smoke that came out from the fire would sweep out forward from the ship. Actually, since there are not one single original Swedish East Indiaman preserved anywhere it was a bit hard to know how it actually would have looked. This reconstruction painting with two fires, one for the common crew and one for the officers appears reasonable believable. This area on board is in general not much noticed and if the fireplaces ever appear in any excavations, it is usually in the form of a pile of bricks. Reconstruction painting and intended book cover for "Jan-Erik Nilsson: Food on-board Swedish East Indiamen (MS)". 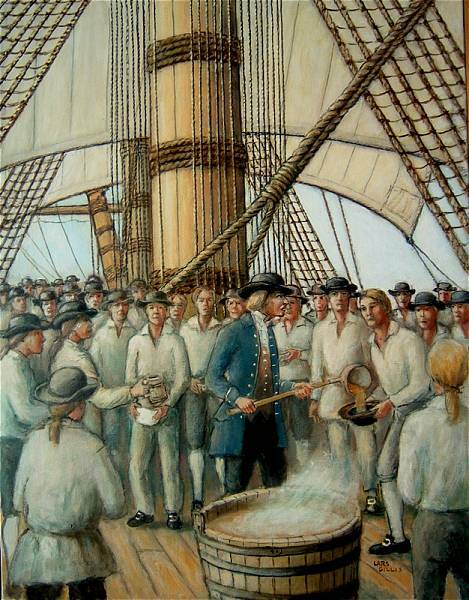 When looking at this painting it is hard to remember that at the time of Lars' painting this picture, there were barely a keel stretched at the shipyard area and that there were nothing like a ship to look at. Still this painting came out very close to reality as it turned out to look like. Acrylic on canvas. Painted for the Gotheborg III magazine as a basis for a sponsoring effort 'component sale' that aimed at asking sponsors to pay for one item at a time from one single ship's iron nail and upwards. At the time of this painting not much was settled on how the interior eventually would look. The most solid document we had at this time was a paper by Eric Lincoln, (Maskinsystem ombord Ostindiefararen Götheborg III. Examensarbete omfattande 4 p. Inst. för maskinteknik, Ing. o Sjöbefälsskolan vid Chalmers Tekniska Högskola 1994) a maritime engineer at that time studying at CTH and one of the participants in the original project Managing Committee. That paper outlined his thoughts on how to carefully modernize an old ship construction towards something that could actually be sailed. I belive that it was Eric that finally killed my dream of having live cattle onboard, something that later generations of people who have actually sailed with our ship has all reasons to be grateful for.